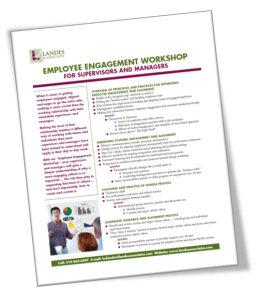 When it comes to getting employees engaged, aligned and eager to go the extra mile, nothing is more crucial than the working relationship with their immediate supervisors and managers. Making the most of that relationship requires a different way of working with teams and individuals than most supervisors and managers have been trained to understand and apply in their day-to-day work. With our Supervisor and Manager Workshop your front-line leaders will gain a deeper understanding of why a more engaging culture is so important … the role they play in supporting that kind of culture … and most importantly, how to create and sustain it. Call us today at 314-664-6497 or send us an e-mail to schedule a workshop for your organization.